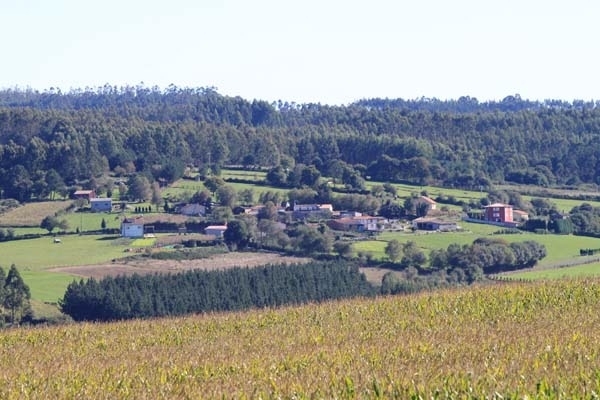 The last stage on the Northern Way before reaching the French itinerary in the location of Arzúa, a landmark where pilgrims from both routes converge to continue, together, on the same path to Compostela, less than 40 kilometres away. This is by no means a fascinating stage for pilgrims, nor will they find any hidden rich heritage. Given the short length of the journey-23 kilometres-it can quite easily be completed quickly, especially by cyclists. The itinerary begins in the monastery of Santa María of Sobrado and from here pilgrims walk in the direction of Arzúa, taking a deviation to the left-one kilometre after the exit-sign posted to Pousada, Nogueira and, Toques. Passing through the locations of Pontevedra, O Peruxil and O Castro. From here the route takes a series of local tracks, well signposted, with a fountain and washing area, from which, a moderate climb to Madelos begins. After passing this point the route then links to a dirt track which leads to a junction with the AC-234/AC-934, next to a sign indicating the proximity of the public pilgrim albergue of the municipality of Boimorto, managed by the council, three kilometres away. It is situated half way between Sobrado and Arzúa and offers many services. The journey departs from Boimorto via a turn off, to the left, next to the health centre and the playground. In the Romanesque church of Santa María de Sendelle, the Neighbourhood Association of Campo da Rula de Sendelle have established a facility for pilgrims (Kiosco do Peregrino) in front of the sanctuary, it functions as an information point and eatery for pilgrims. They also stamp the credential. From here there are just 6 kilometres until the end of the stage. O Castro, Casaldoeiro, with a bar (Meson Rio Iso) and O Viso, situated at the doorway of Arzúa are all passed. After a climb, there just remains a descent to the centre of the village, a milestone where the French Way and the Northern Way unite. Although this is a comfortable stage for cyclists, there is a variant route that can be taken to accelerate the arrival to Compostela. This option is taken in Boimorto: instead of continuing on the official route at the turn off next to the health centre in the direction of Sendelle, pilgrims can continue to the right on the CP-0603 to reach the itinerary of the French Way in Santa Irene, in the Council of O Pino, some 20 kilometres away. 1 reviews Distance to Santiago: 60 km. 1 reviews Distance to Santiago: 50 km.